Slicers in Excel are often termed as Visual Filters. 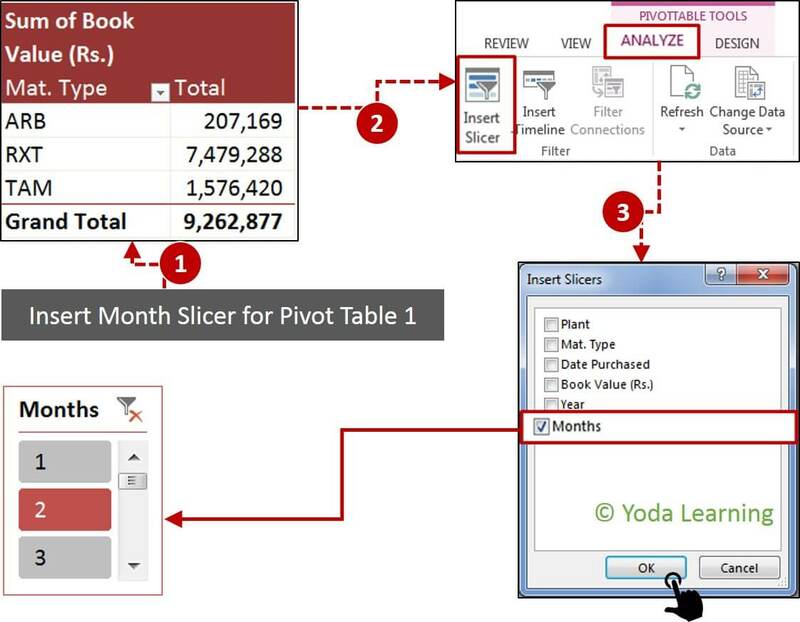 With Pivot table Slicers in Excel, you can filter Pivot Tables. Besides, Report Filter can also be used to do the same task. 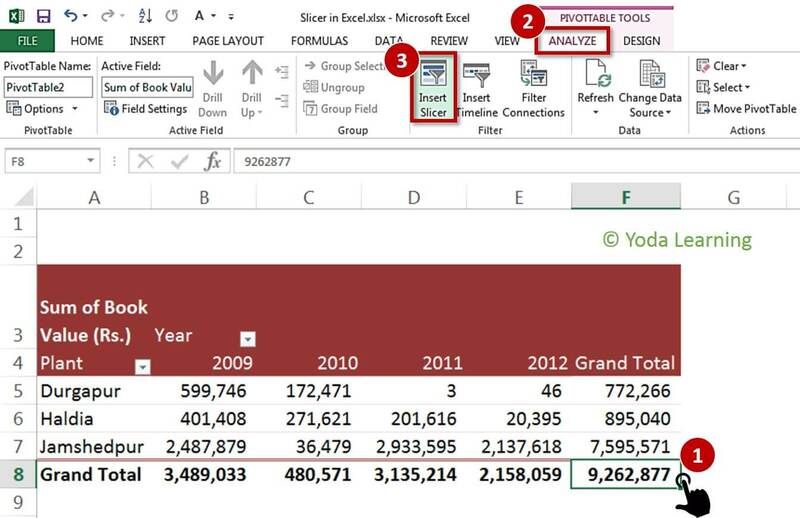 Slicers were first introduced in Pivot Tables in Excel 2010 for Windows. And it came in Excel for Mac in 2016. Slicers in Excel are the Buttons, using which you can filter Data (of the Pivot Table or the Pivot Chart). Click on the data type that you want. Slicer in Excel will make it a lot easier for you. It will help to comprehend the distinctness shown in the Filtered Pivot Table. Adding interactivity in Reports has always been beneficial. In case, if you love Dashboarding and filtering, Excel Slicers are the best to do so. 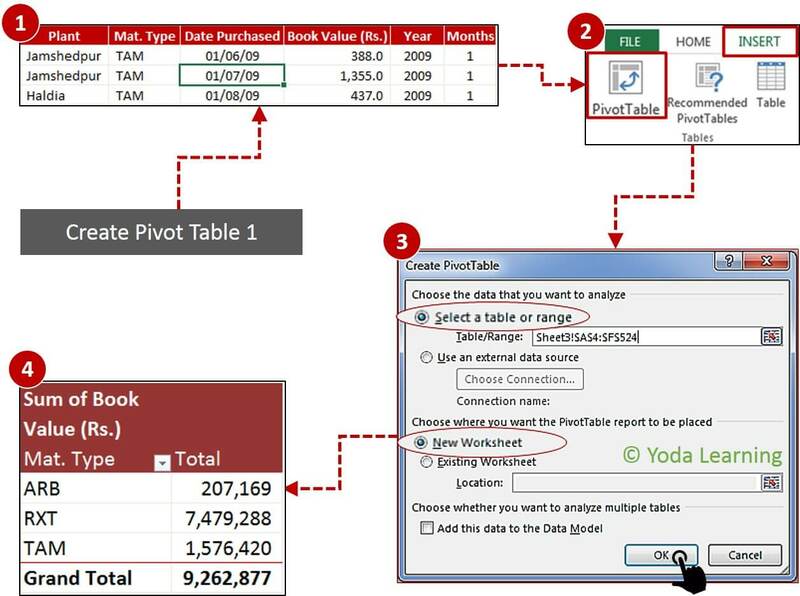 A Pivot Table Slicer helps to customize the Pivot Table. Unfortunately, Slicer helps to filter and connect many Pivot Tables as per your wish. How to Insert a Slicer in Excel? Conclusion: You just learned how to Insert Slicer in Excel. What are the Different Ways to Filter an Excel Slicer? How to Add Columns to Slicer Buttons? How to Connect Slicers to Multiple Excel Pivot Tables? Learn how to connect a Slicer to Multiple Pivot Table? How to Lock the Excel Pivot Table but not the Slicer? Go to Analyze (Excel 2013 & 2016) and click on Insert Slicer. Go to the Options tab and click on Insert Slicer if it is an older version of Excel. It will add pivot table in Slicer. 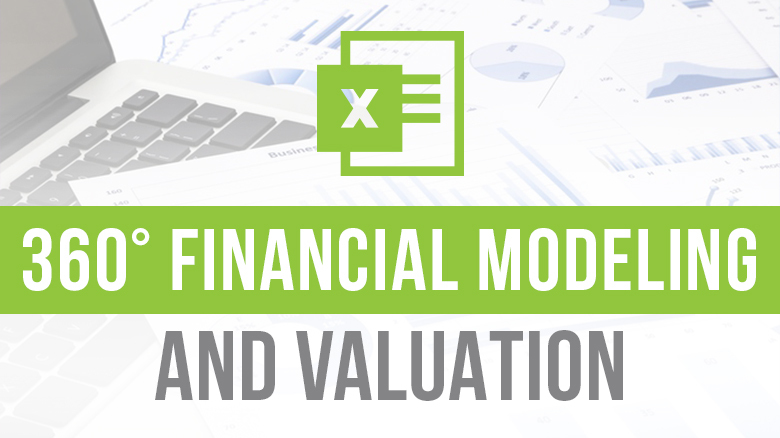 Do you know anything about Conditional Formatting with Formulas? Sometime back, I wrote a blog on Conditional Formatting with Formulas. You can learn a lot from it. Click on the link to get directed to the blog. Slicers in Excel, allow you to see what items have been selected within a Pivot Table. You have to understand Slicers’ in order to woo your team. Select the Year and Month as the Pivot Table Fields, in the Insert Slicer Dialog box. As a result, You can see the slicer in front of you. Since you’ve obtained a Slicer. Now you can play around with your Data. TIP’s: In order to select more than one item, hold down the CTRL key to select multiple items in your Slicer. Since you already know, ‘Slicer is a new feature which was introduced in Excel 2010 and in Mac for Excel in 2016. You must learn what are ways to Filer an Excel Slicer. Excel Slicers are really wow. And, there isn’t one but several ways to filter an Excel Slicer. Select an array of items. Click on the left mouse button and now drag it. Drag it in the motion Downwards and Upwards within the Slicer. You just learned the different ways to filter an Excel Slicer. Adding an Excel Slicer to your Pivot Table always defaults to one column. This displays the items in a vertical layout. If your Slicer displays the months i.e. from January to December (1-12), the layout of the buttons can be change and you can show this in 3 separate columns, and this will be considered a “Quarterly View”. Click on your Slicer. Go to Slicer Tools > Options > Buttons > Columns. With the help of the Scrollbar you can select the no. of Columns you need. Therefore, You can increase as well as decrease the no. of columns using the Scrollbar. So now, you have to manually type the number of columns you need to show your Slicer. Step 3: Select no. 3 in the Columns. Well, you can clearly see in the above image, your Column has a 3-Column Layout. You just learned How to Add Columns to a Slicer Button. There are quite a few and distinct Slicer Styles. You can find these when you click on an Excel Slicer. You can find the Slicer Tools tab in the Ribbon under Options > Slicer Styles. As you read it earlier, you can even add columns into a Slicer. Check out for more Slicer Options by Right Clicking in a Slicer. Select a style that you’d prefer. Wow! As you can see, your slicer has got a completely different style now. Normally when you insert an Excel Slicer it is only connected to the Pivot Table that you are inserting it from. Now imagine, if you’ve obtained Multiple Pivot Tables from the existing Dataset. Which step can you possibly take to connect all the Pivot Tables with the Slicer? In such cases, you’ll want all the Pivot Tables to change with just a Press of a Button. Tip: Name the Table from where you’re going to take the Data. We have named it as Table 1. Selecting Material Type as Rows and Sum of Book Value as Values. Selecting Plant as Rows and Sum of Book Value as Values. Click on the first Pivot Table. As you can see the Month Slicer has been inserted in front of you. You’ve to repeat the same steps to insert a Slicer for the second Pivot Table (Year Slicer in this case). Click on the second Pivot Table. As you can see the Year Slicer has been inserted in front of you. Right now, you have a slicer in your worksheet. 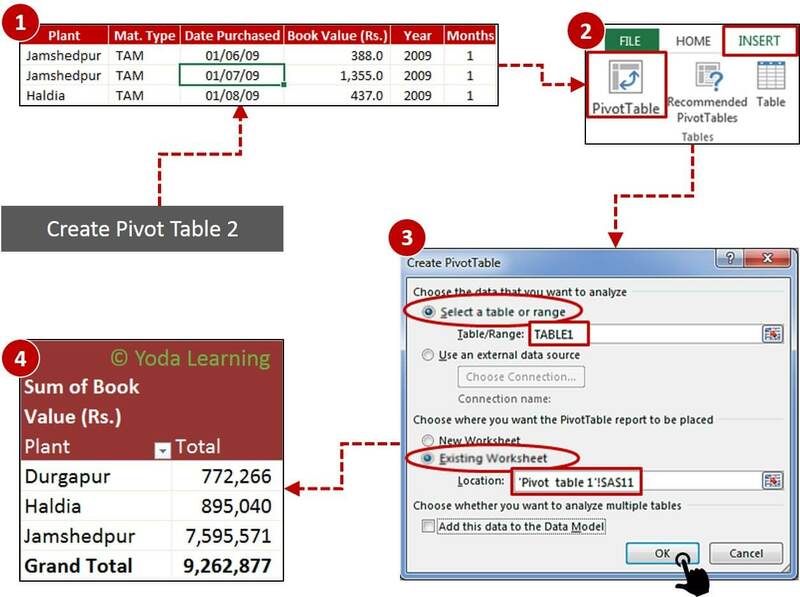 With this, you can filter the pivot table in which you insert it. 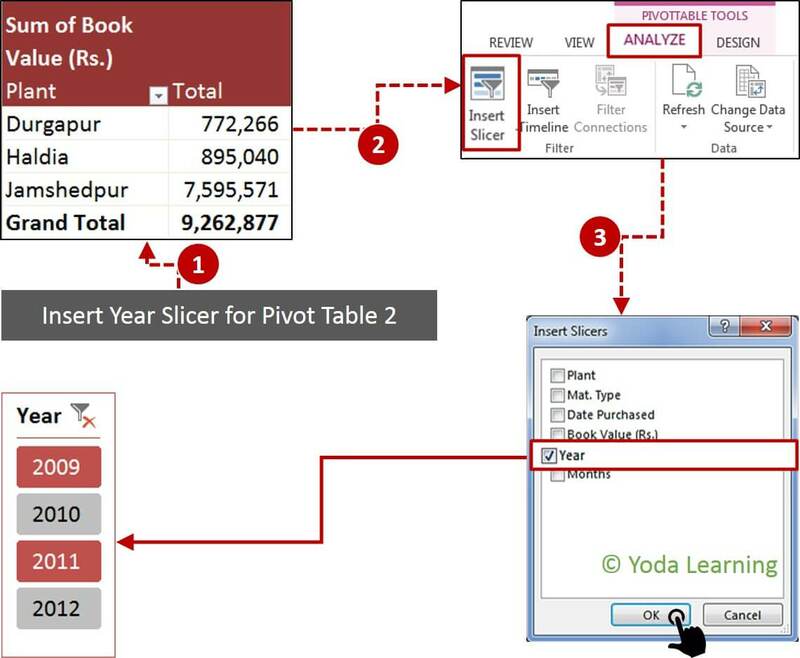 Note: Repeat the same steps to connect the second Slicer to the Pivot Table (Year Slicer in this case). On selecting each Slicer’s items, you’ll find the Pivot Table will change. At times, if you share an Excel Pivot Table with your Colleagues there is a high risk of your Data-exposed. Howsoever, you wouldn’t want any of the Users to have the access to your Data. As a result, they might end up messing up with your Pivot Table Layout and Format. In these cases, you should lock your Pivot Table. Therefore, this will only allow the user(s) to make a selection of the Slicers. Here, your Report will look interactive. Also, this is even secure from Excel novices like your Boss. Under Size & Properties “Uncheck” the Locked box. Seems like, you just read and learned about Slicers in Excel. The tutorial covered how you can insert a Slicer. Also, the different ways to filter an Excel Slicer. Furthermore, How to add Columns to a Pivot table Slicer, Slicer settings and styles . 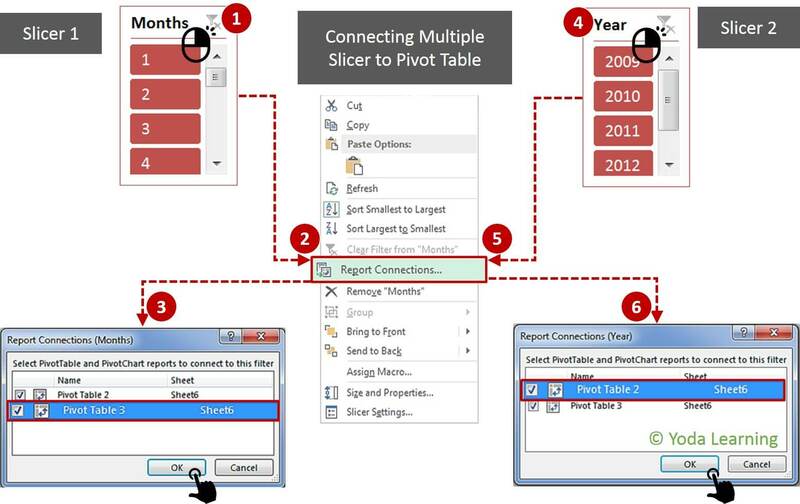 How to connect slicers to Multiple Pivot Tables in Excel. 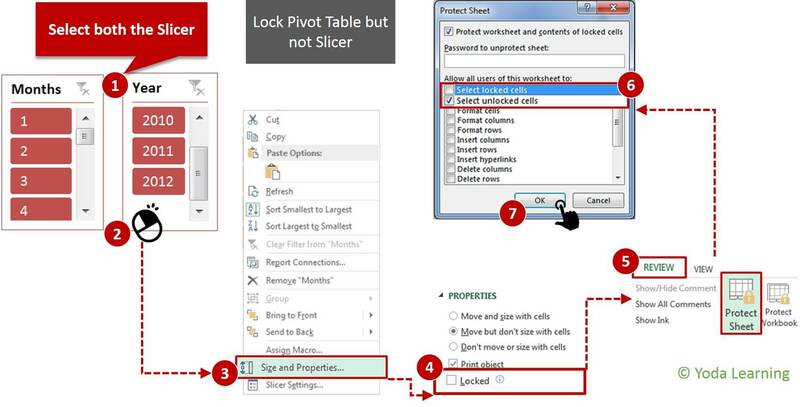 And, how to lock the Pivot Tables and not the Slicer in Excel.